Egyptian Museum, Cairo. 1st. Dynasty 3200 B.C. 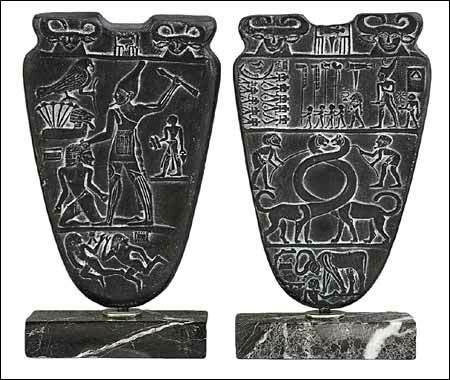 This palette commemorates the victories of King Narmer, also known as Menes, the first Pharaoh and the unifier of Upper and Lower Egypt. The upper part has on both sides, the bovine heads of the Goddess Hathor. The reverse side shows the King brandishing a mace, poised to smite a prisoner. This symbolizes the triumph of order over chaos. In front of Narmer, the Horus falcon, protector of Kingship, holds a prisoner by a rope. Below are shown two slain enemies. The other side shows the King escorted by standard-bearers, approaching the temple of Horus and inspecting the beheaded corpses of enemies. The central part has the intertwined necks of two beasts held on leashes. They represent the two rival halves of the land now subdued. At the bottom, the King is portrayed as a bull destroying a captured fortress. The events commemorated here, led to the unification of the country, the beginnings of official hieroglyphic writing and divine representations, and therefore render this palette one of the most famous and important pieces in Egyptian art.